I play as a gender-ambiguous slave named Aren, there’s my buddy Briana, we fight and fight and eventually escape the orc lair with some weapons and maybe something that qualifies as loot. This is fun! What bugs me is the gameplay. 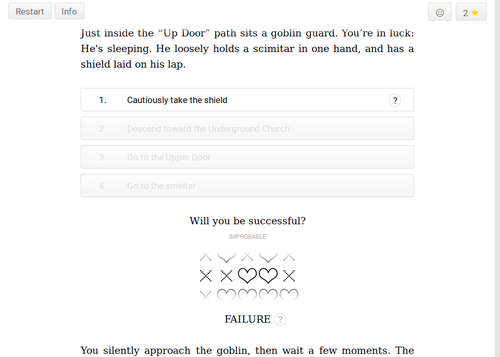 The platform is named “eGamebook”, but it is no Fighting Fantasy. The game obscures most of the mechanics and choices; even the inventory is hidden from the interface. That’s a very broad definition of a gamebook. The fight system is cool but it packages a very complicated system into something that’s just as complex and obscure. I’m not even sure how many hit points my character has. The enemy is far enough for you to throw a spear at them and ready your other weapon before they close in. This is practically useless. I have to visualize the battle and see that throwing would have a probability of “Possible”, and if I look at the source code I can tell that the “Possible” word means “somewhere between 40% and 49%”. Why do I have to decipher this? It’s supposed to be a fun quick battle, not a painful guess-in-the-dark. 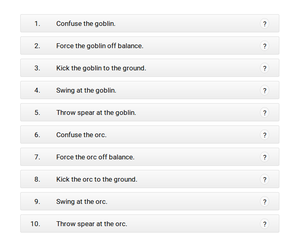 I’m not even sure what’s the difference between the goblin and the orc: is the orc easier to hit? How many hit points do they have? Does it actually matter? Sometimes, when you fail a roll, you can spend a resource you’ve acquired to re-roll. By the way, the game has no manual saves or UNDOs. Giving me only two precious rerolls and then taking them away for some of the choices is cruel with an extra spike on top. About halfway in the story the hero suddenly says “I am not a farm boy”, so he’s not genderless. (I guess I could pay more attention to the male hand on the illustrations, but seriously, the illustrations are just: a hand and a sword. Not even a background.) He’s not nameless, at least, though the game (and his partner) constantly refer to him as “You” as if he’s a true AFGNCAAP. The ending gives another plot twist, but I didn’t care at that point. Because I won a cool dungeon crawl.